China Flexes Muscles With Parade, But Announces Troop Cut : The Two-Way More than 12,000 precision-drilled soldiers, 500 pieces of military hardware and 200 aircraft filed through Tiananmen Square. 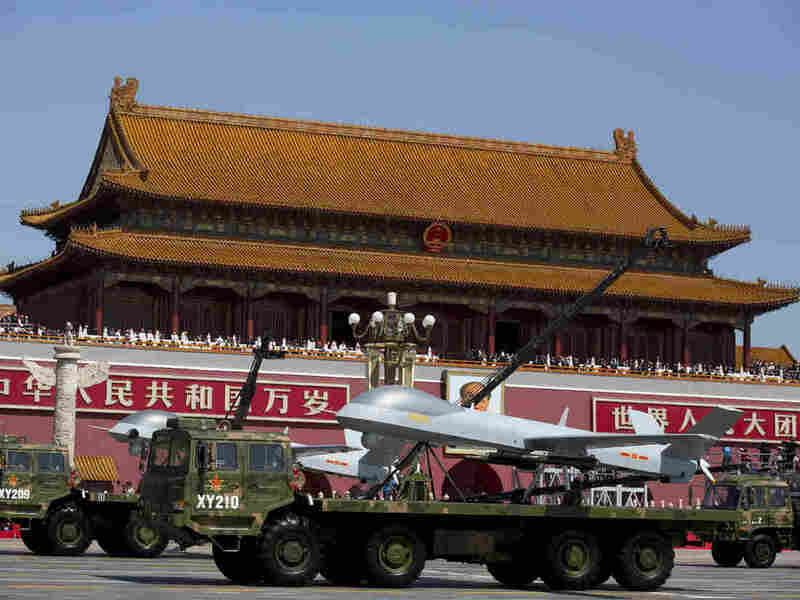 Military vehicles carrying Wing Loong — a Chinese-made, medium-altitude, long-endurance, unmanned aerial vehicle — drive past Tiananmen Gate during a military parade to commemorate the 70th anniversary of Japan's World War II defeat in Beijing on Thursday. The parade — meant to mark 70 years since Japan's defeat at the end of World War II — comes a day after the Pentagon said it was tracking the movements of five Chinese warships in the Bering Sea near Alaska's Aleutian Islands, what one defense official quoted by The Wall Street Journal described as a "first" for China, although the official said the vessels' movements did not appear threatening. "involved more than 12,000 troops, 500 pieces of military hardware and 200 aircraft of various types, representing what military officials say is the Chinese military's most cutting-edge technology. "The parade is part of commemorations packaged to bolster the ruling Communist Party's self-declared role as the driving force behind Japan's defeat 70 years ago and savior of the nation, though historians say the rival Nationalists did most of the fighting. The events also minimize the role of the U.S., Britain and others, although Beijing has attempted to stress the support it has received from a wide spectrum of foreign nations." Xi, speaking to an audience from the rostrum overlooking Tiananmen Square before the parade began, said: "China will always uphold the path of peaceful development." Chinese President Xi Jinping offers a toast in Beijing on Thursday after delivering a speech during a reception to mark the 70th anniversary of Japan's surrender during World War II. Among other things, Xi announced a 300,000 cut in troops. He also said Beijing would reduce its 2.3 million strong military by 13 percent. "Delegations from 51 countries were invited to attend the parade, and Japan and the Philippines opted against sending anyone. Leaders of major Western countries will also be absent from the viewing stands in Tiananmen Square. "'Thousands of British servicemen died in WW2 in Asia and it's right that we commemorate that,' UK Foreign Secretary Philip Hammond said on a trip to China in August. "But then he added: 'We are not huge fans of military parades, showing off shining new aggressive equipment, in general.'" "The parade is politically necessary," Bai Nan, 23, an engineering student, was quoted as saying by The New York Times. "It will tell the people that China is now a strong country. And it will also somehow [make] the people respect the government." 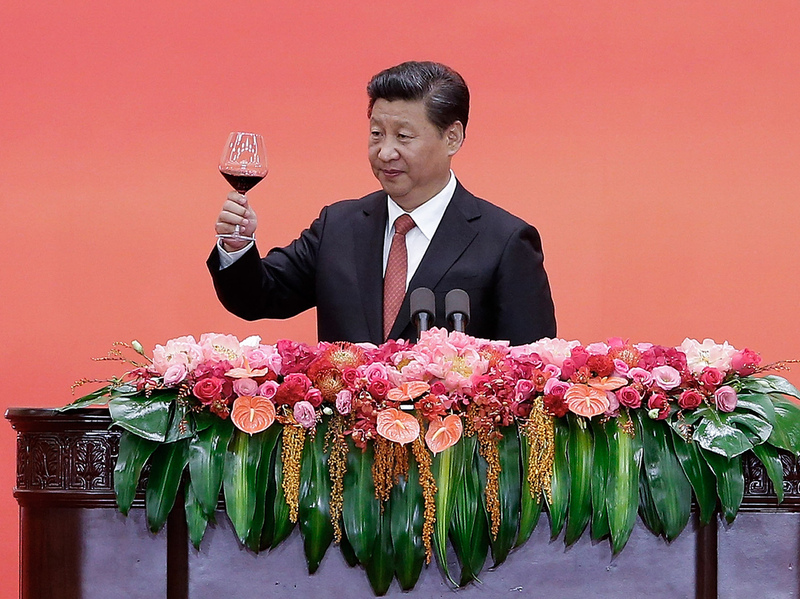 "I admire President Xi," he said. "He is capable in everything from anti-corruption to the conflict in the South China Sea. He is a great man." Reuters notes: "The [Defense] Ministry said the cuts would be mostly complete by the end of 2017. The move is likely part of long-mooted military rationalization plans, which have included spending more money on high-tech weapons for the navy and air force. Troop numbers have been cut three times already since the 1980s."